A beautiful anomaly: Lorna Irvine on choreographer Marc Brew’s provocative hybrid of gig and dance. Who, or what is Brewband? They emerge from the darkness, this supergroup of six, and boldly proclaim, ‘We are here to confuse you’. Choreographer/dancer Marc Brew, who came up with the concept,and also directed, simply insists they are a cross-pollination of gig and dance performance. But the truth, as with so much of Brew’s work, is not so simple, nor reductive. They are a provocation, an incantation, a celebration. They are loose, yet oh so slick, bringing wry testimonies to the space (‘What is your real job?’ ‘You work in mental health?That must be sooo rewarding’). Merry pranksters, one and all. Puckish and punky. Even their artwork, which resembles the anarchist symbol in the spokes of a wheelchair,is deliberately cheeky, a subversion of something which was once subversive, but has been culturally appropriated through the years. They are here to reclaim the space. Weaving through the wonderful music, which is as delicate as a music box or ferocious as a hurricane, are three main dancers: Martyn Garside, Alice Shepperd and Marta Masiero, clad in theatrical colourful clothes and striped leggings. They too sing and play, blurring the roles. Sparrow and the Workshop/BDY PRTS’ singer Jill O’Sullivan brings her sweet, expressive vocals to music by Graeme Smillie and Peter Kelly. Kelly’s drum kit gets dismantled by all in one surreal sequence, and he moves between them, attempting to hit component parts. Garside lies underneath a drum and makes it drone using his voice and mic, thus the inner pulsing human rhythm is explored. One of the most affecting dance sequences occurs between the two women. Shepperd hoists Masiero up on her wheelchair, and they sensually glide together, and tenderly tangle and untangle their limbs like a knotty puzzle- two parts; a visual representation of duality. ‘Aaaaaaaaaa”s and ‘Ooooooo”s curl out on the screen behind them, with Jamie Wardrop’s ravishing visuals featuring BSL interpreter K Yvonne Strain as almost another cast member, grooving behind them as she signs the lyrics. It is the integration of ideas; heart and humour, as well as an unflinching eye for everyday survival, that Brew and assistant director Alex McCabe bring to the piece. The work is moving, yet never mired in trite sentimentality or prosaic things. Jack ‘out of the box’ movements give way to frenetic, acrobatic tumbles on the floor. Shepperd wheels her chair, while walking on her hands; Masiero becomes a pagan soloist next to a lake comprised of lights. The folky lullabyes become a low drone, or dissonant guitar shredding a la early Sonic Youth and the post-rock of Godspeed You! Black Emperor. At times, the dancers are propelled forward like rockets, or undulate in a trio, swinging from side to side.Yet, when a moment becomes gets too comfortable,there is a conscious shift in direction, undermining expectations. Such fluidity is a response to the lyrics. “I take your eyes and smash them into mine”, O’Sullivan plaintively sings,”So I can see if we see colours the same way”. Brewband exists to make the audience see colours through new eyes,shapes and things that are taken for granted repurposed in an entirely new way. Job done- a beautiful anomaly. What is a ‘proper’ job, anyway? 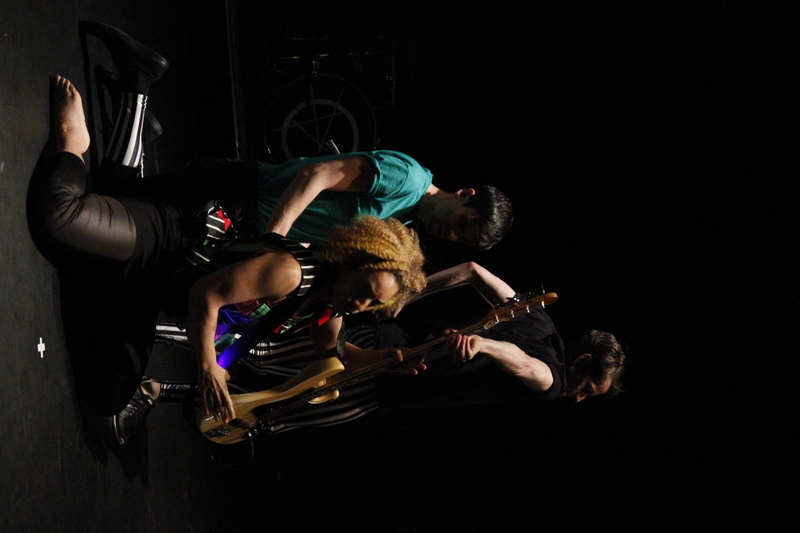 Brewband was on at Traverse Theatre on 6th May. It will continue to tour in Spring and Autumn 2017.